Here is a list of best free website downloader software to download website locally on your computer. These freeware let you download entire website locally on the computer so that you can browse the web content even when you are offline. These are quite easy to use so that you don’t have to worry about how to download an entire website. Here you have to simply enter the website URL, set download location, set the options for the download as per your requirements, and you are good to go. Some of these can also be used to get ideas about missing links, and get an idea about the website problems. The Website Downloader Software that I like the most is WinHTTrack Website Copier. This is because it is quite easy to use and offers a lot of features. You can choose to download from a number of options available, test links, and update the download. Several rules can be set to limit the search, and set the scan rules. It can also be used to generate log files, create index, make word database, make mail archive, and many more such options. 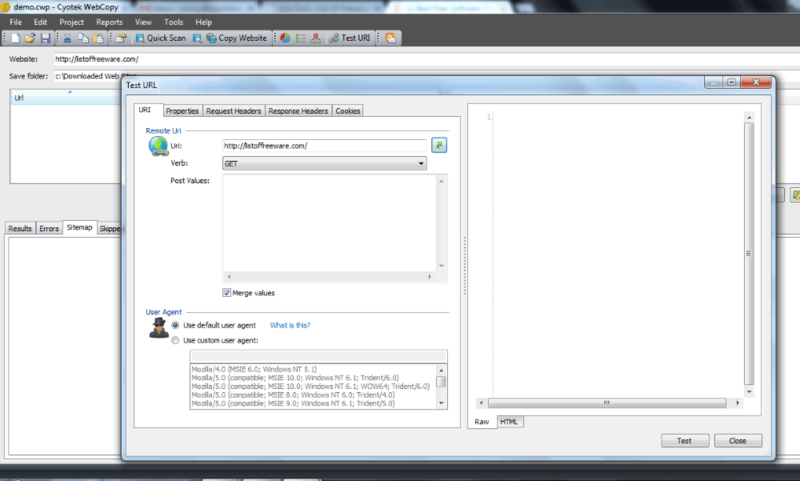 You can also check out Bulk Image Downloader Software, Online HTML Editor, and Offline Browsers. WinHTTrack Website Copier is a simple freeware which lets you download entire website for free. The best feature that this website offers is that it is quite simple and easy to use. Firstly you have to enter the project name, select project category, and select the base path. Then you have to select the action from the list of available actions, i.e. download website, download website + questions, get individual files, download all sites in pages, test link in pages, continue interrupted download, and update existing download. URL list can be added via the text files also. Set proxy, scan rules, limits, flow control, links, build, spider, MIME types, Browser ID, Log, index, cache, and various other options. In the experts only tab, other settings of primary scan rule, travel mode, global travel mode, activate debugging mode, and rewrite internal/external links options can be chosen. Can also choose for the remote connection options, set the option to disconnect when finished, shutdown PC when finished, and put the download on hold. Can also be used to set scan rules, include or exclude certain types of file, set limits, and other parameters. You can set the option to download, and test links, file structure, select java files, accept cookies, create log files, create index, make word database, build mail archive, set browser ID and many such options. The MIME associations of different file types and its MIME identity can be easily configured. 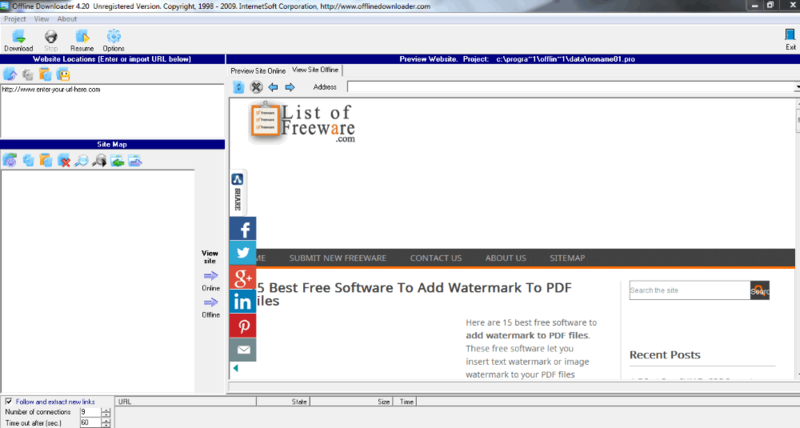 Cyotek WebCopy is a simple freeware which can be used to download websites locally on the computer. Here you have to simply enter the Website URL and select the folder where you want to save the website. Can also set certain rules to be followed for the download, like: include or exclude certain content, crawl or not crawl content, use full URL, reverse, pattern, and replacements. User name and password can also be added. You can either browse the website locally, or remotely, preview a local file, create rules, view link maps, view URL properties, and copy the selection. Finally, the list of contents can also be exported in the CSV format. Different reports are generated to display the results, errors, site map, skipped files and missing files. It can be used to perform a number of operations and personalize the download. You can perform quick scan, scan the website, copy the website, copy the settings, check for additional host, include or exclude certain documents, use proxy server and user agents, and change many other settings. It can generate a number of reports, like: empty metadata, external URL's, images, not found, redirects, slow pages, and many more. Can also be used to generate graphical reports like website link, website diagram, statistics and many more. Displays the missing links which can thereby be used to maintain websites and enhance the functionality of the websites. Offline Downloader is a good software which lets you download website content locally and view it offline whenever required. Just enter the website URL, and the location where you want to download the website. Then the website is downloaded and displayed under the site map. You can preview the website online or browse the site offline. Option can be set to follow and extract new links, set the number of connections, time out, and time limit. The site links can also be input via a text file, and the downloaded site link can also be displayed in the form of text file. The download options can be paused and resumed at any moment of time. You can save all the import and export links in the form of text file. 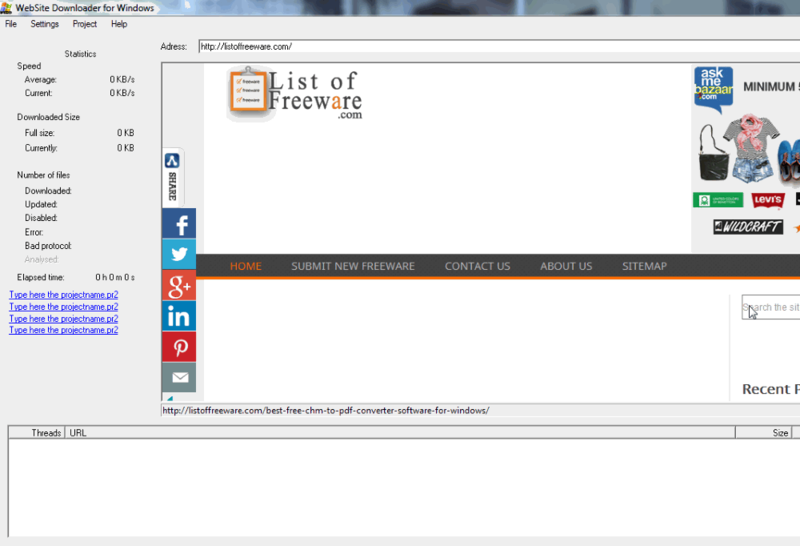 This freeware also lets you set different options like folder location, download options, link level limit, directory and subdirectory options, connection, password, proxy, filters, domain, directory, browser, display, and schedule options. But there is a limitation in the free version which doesn't let you download more than 5000 files in a single session. Browse to the HTML Spider tab, and click on the download website button. Then in the new window displayed, add the Website URL, select the options of the download, like: folder structure, depth of downloading, option to store server's pages, to remove completed downloads from the list, folder location of the download, group, and schedule of the download. In case login options are required, you can also add user name, and password. The download option can be started either automatically, manually, or can be scheduled as per the convenience. In advanced menu you can also set various other settings, like: extensions of web pages, to download CSS files or not, whether to download files from other sites or not, whether to download images, to download images from other sites, elimination of images by extension, to download files, download files from other sites, to eliminate files by extension, and many more such settings. Inspyder Web2Disk Trial is a simple website downloader software which can be used to download entire website locally on the computer for easy browsing when offline. Enter the root URL, and the folder location. On clicking the Go button the website is downloaded locally. You can also enter username and passwords, check and set options for excluded pages, set download options, crawler options, domain aliases, root URLs and soft 404 detection. 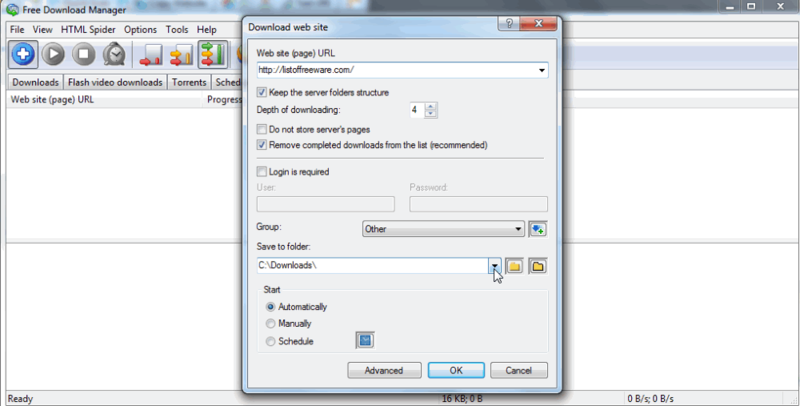 In download option you can set the download options, like: fix URL for offline browsing, rename file and dynamic URL, flatten directory structure, auto correct HTML, create URL to file map, add date to old downloads, create autorun file, create change log, and add download metadata option. The crawler delay, crawler timeout, user agent, file size and URL limitations can also be specified. You can also limit the crawl using page depth or page count. But you can't have more than two active projects at a time, and schedule projects in the free (trial) version. Darcy Ripper is a simple Java application to download websites for offline use on the local machine. Just click on the create new button and enter the details of the website like name, URL, path, option to download entire website, to save to disk or not save to disk, number of parallel downloads, and to drop ignored and finished links. Change the connection settings if required, like: maximum connection number, maximum retries number, proxy settings, requests and referral settings, bandwidth limit, authentication settings, cookie settings, HTTP response settings, and various other filters options. Then on clicking the start button the entire website is downloaded, showing you different details of URL, state, progress, size, priority, depth, status, HTTP reply headers and many more such options. The job packages can be saved so that you don't have to configure the same elements later. ScrapBook is a simple Firefox extension to download websites. It can be used to download webpage, website content, and even entire websites. On installation, it adds a context menu to the Firefox browser which can then be used to download the webpage or the website with a single click of a button. Open the website that you want to download and right click to display the context menu. Then as per your selection the files are downloaded which may take some time as per the website size. During download it can be filtered, paused, skipped, or aborted. WinWSD is a simple freeware which lets you download entire website for offline use. Select the option new project and enter the project details, like: URL, project name, project type, project directory, and other relevant details. Then click on add button after which you have to click the start button to start downloading the site. Details, like speed, downloaded size, number of files, and elapsed time is displayed. It also displays a number of options like size, downloaded, status, and so on. Getleft is a simple freeware which can be used for downloading websites locally on the computer. Click on the enter URL button, after which you have to input the URL, directory, and select the option of start now. You can also opt to choose the uplinks, update, CGI, get map HTML only, levels, external links, and image download options. This freeware can also be used to purge certain file extensions like PDF, JPG, GIF, MOV, MPG, and many more. The options can also be set for delayed download, and the days to schedule download. The website download can be paused, stopped, or resumed at any moment of time. 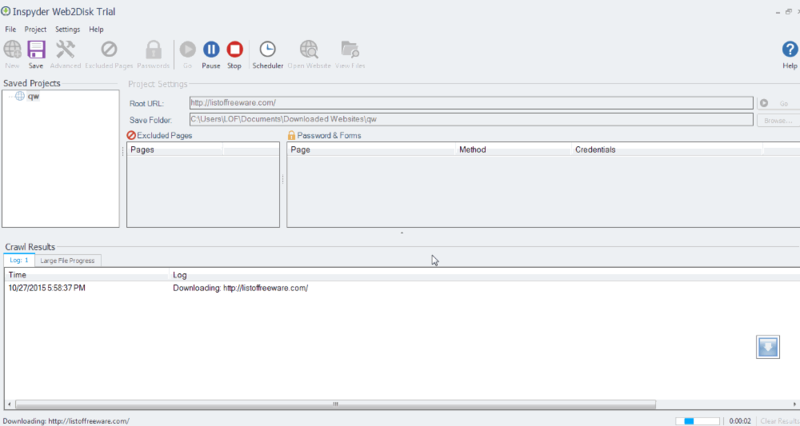 Full Website Downloader is a simple freeware which can be used for downloading websites. Just enter the URL, download location, download depth, option to download images and resources from external sites, exclude files containing a certain name, and exclude files containing certain file extensions. 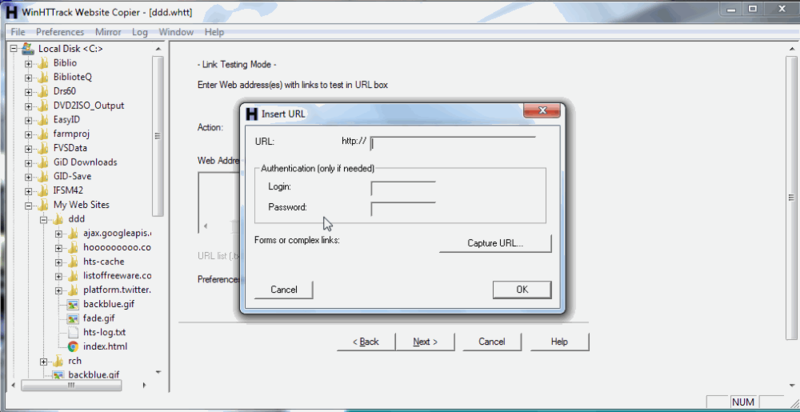 Can also provide login information to the server to download password protected websites. Displays the information of the downloaded files, total files, and progress. Process can be aborted at any moment. Website Copier is a small and simple website downloader software. Here you have to simply enter the URL of the website that you want to copy, set the folder location of the website to be downloaded, and click on the download button. Information of the files downloaded currently is displayed. Download can be stopped at any moment.